While some young people are fortunate enough to enjoy regular trips to the theatre, a gallery, or museum, many aren’t. While some kids get to have a go at arts and crafts activities at home, or attend a drama club after school, plenty don’t. And for some, the idea of actually getting involved with something on the ‘creative’ spectrum can be seriously daunting as it’s just not what they’re used to. Our ‘Hometown’ mini residency, however, was designed for all the kids – that’s each and every one of the 186 young people – at St Mary & St Giles School in Stony Stratford, Milton Keynes. 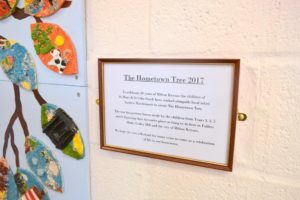 Every young person from Reception all the way up to Year 6 participated in the Hometown Mini Residency – and plenty of the teachers got stuck in too (learning new skills and techniques to use again). With the assistance of ceramicist, Andrew Macdermott, each person created a leaf that depicted their favourite place in their hometown. The leaves were then glazed by the students, and Andrew fired them in his kiln. 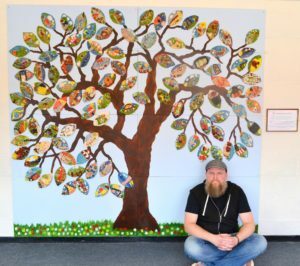 Finally, all the leaves were brought together to create a ceramic tree – a permanent piece of artwork that has been installed in their new school site, St Giles South. You might think by now that the young folk of St Mary & St Giles School deserved a breather, but no – we knew they could achieve more. 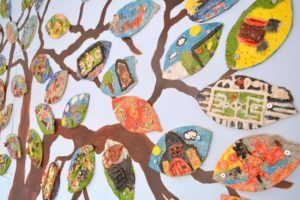 So it was mosaic artist, Dionne Ible’s, turn to get those kids who hadn’t had a chance to try their hands at ceramics, working towards creating a smaller-scale #MK50 – inspired mosaic piece that would also have a permanent home at the school. Kieran says he plans to use The Culture Challenge website in the future, and will do this by having an objective in place, so that he can research the cultural providers available, and ensure they can work to his required specification.